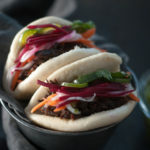 Steamed Banh Mi with beef cheeks and pickled veggies are over the top delicious. I love the briny crunch of the fresh vegetables. 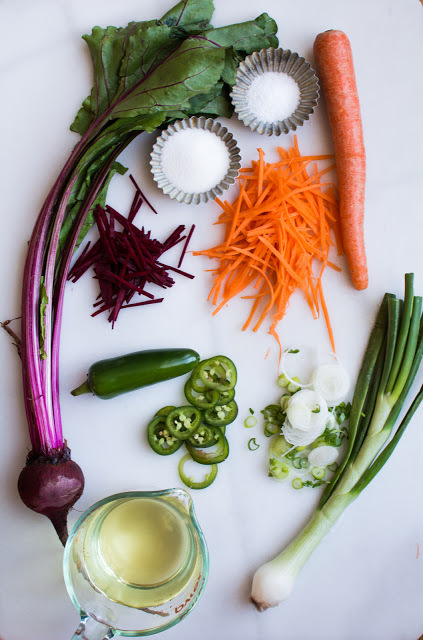 I really love raw beets, that why I decided to quick pickle them along with the carrots, jalapenos and spring onions. I generally add cucumbers to to mix as well, but I used up my cukes juicing. 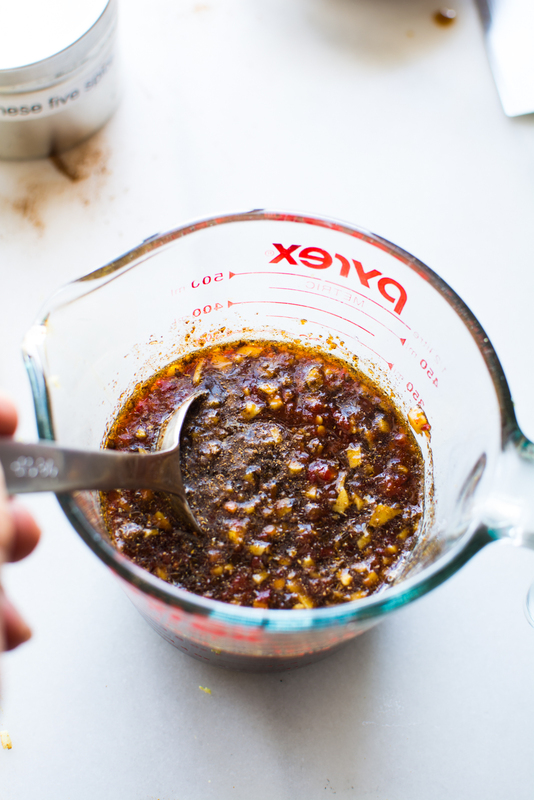 Don’t look at the recipe and freak because there are more than FIVE ingredients. Please have an open mind. This is a pretty simple recipe and will blow you away with flavor. You won’t regret it. All of the components can be made a day in advance, which makes it a breeze to put together. I have a recipe for Steamed Buns on the blog with step-by-step, of course. Someday if you’re feeling all gourmet, give them a try. If not, another option would be to purchase frozen buns from an Asian market and re-heat according to the package directions OR you can just purchase some baguette and make a killer sandwich OR if you are GF or Paleo, snuggle everything inside a nice bibb lettuce leaf. 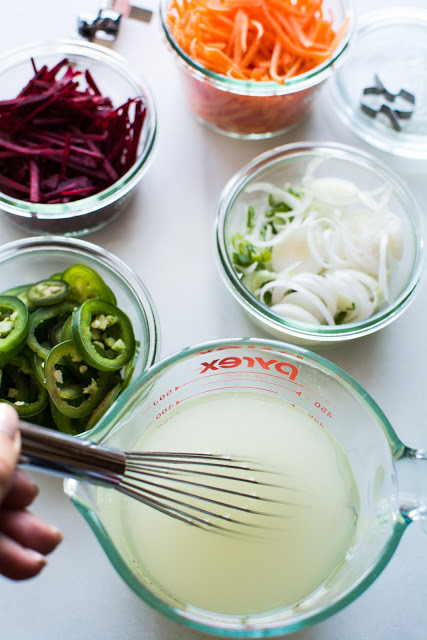 Let’s start by making some quick pickled veggies. Yes, you can make these a day ahead. Maybe even two days. Dissolve 2 tablespoons sugar and 1 teaspoon salt in 2 cups rice vinegar. Place all prepared veggies into individual jars. Pour vinegar mixture to over veggies. Cover with a lid and refrigerate until ready to use. Oh Snap! That was easy. I received my Butcher Box for February and was completely surprised to see Beef Cheeks in the box. Whaaaaaa? I have never, ever in my life found beef cheeks in a Utah butcher store. EVER! 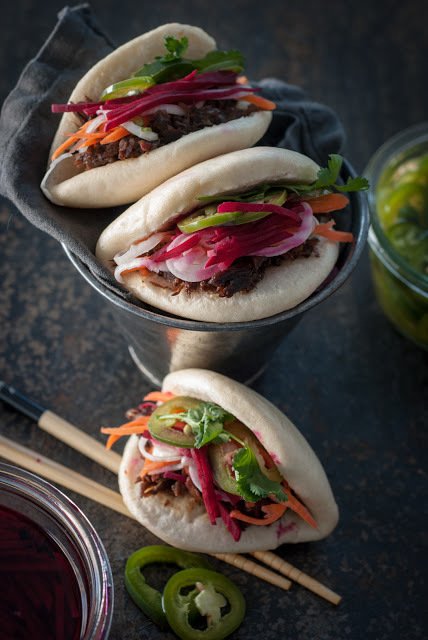 I was pretty excited and knew that I was going to make steamed buns with the cheeks. I’ll let you know right up front that I don’t eat a lot of meat. When I do, it’s got to be awesome. I realize the list looks overwhelming, but it isn’t. 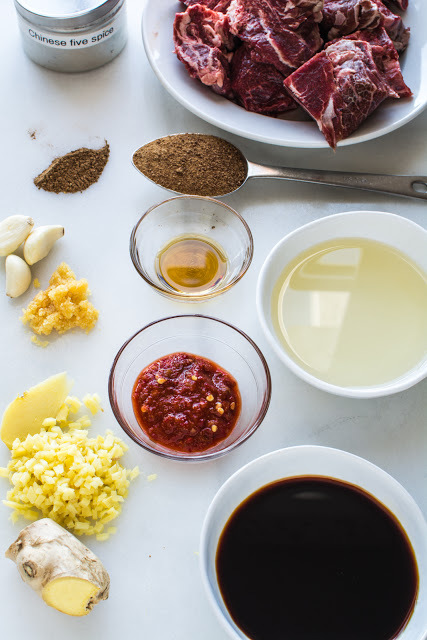 Most of the ingredients are going into a sauce that the beef in cooked in. Basically you are going to measure, stir, pour, cook. Easy peasy. In a small bowl, stir the first 8 ingredients together. That would be the garlic, ginger, soy, vinegar, Chinese five spice, coconut sugar, chili garlic sauce and sesame oil. Just stir it all together. Melt 2 tablespoons coconut oil in a pan, heavy pot or in the pan of a pressure cooker. 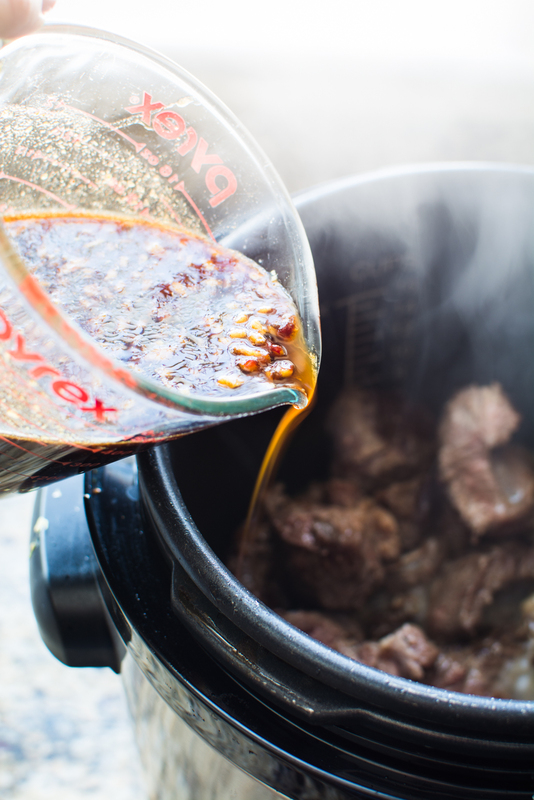 Add beef to the hot oil. Brown on all sides. Don’t over crowd your beef or you will be steaming it instead of browning. Once the beef has browned remove from pan. 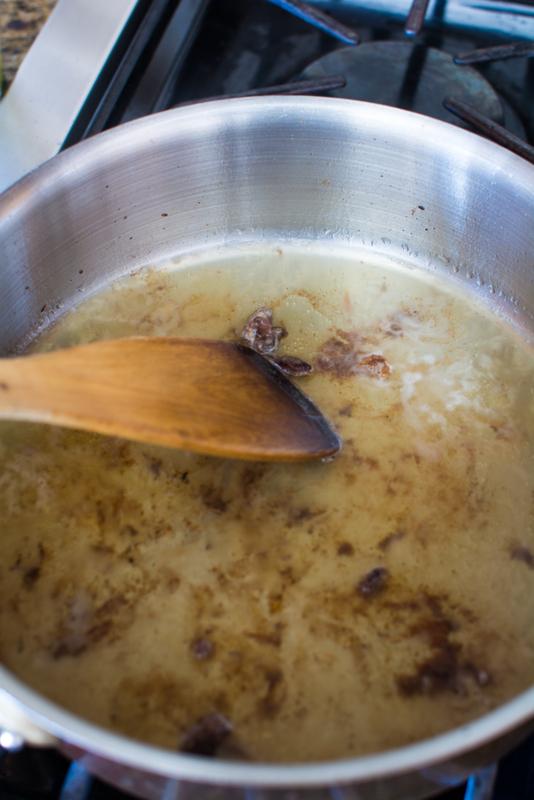 Deglaze the pan with 1 cup coconut water, unsalted beef broth or just plain water. Return the beef and coconut water to the pot your are going to cook it in. It can be a heavy pot, crockpot or a pressure cooker. You choose. Pour the soy mixture over the meat. Cover with a tight fitting lid. Place covered pot in a 275 degree preheated oven and bake for 4-5 hours. If using a crockpot, cook for 4 hours on high heat. If using a pressure cooker, cook for 30 minutes then let the pressure release on it’s own. One the beef cheeks are nice and tender, remove from pot and shred with two forks. Drain off as much fat as possible from the juices in pan. Reserve the juices and discard the fat. Return meat and juices back into the pot. I like to let the meat warm in the juices until ready to serve. If using a crockpot, turn to low until ready to serve. If using a pressure cooker, keep on warm until ready to serve. I have kept the beef on low for as long as 4 hours. You can also, keep warm on a stove top. So many choices. 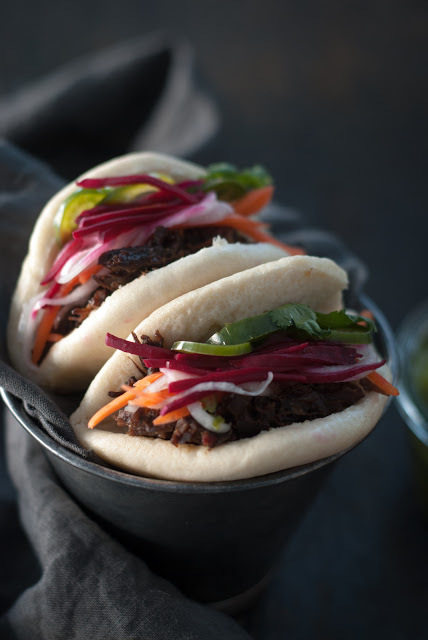 To serve, arrange beef in a split steamed bun. 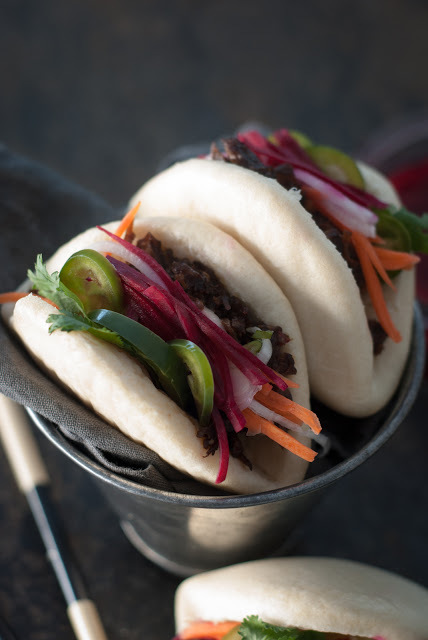 Top with pickled veggies and a drizzle of sriracha. 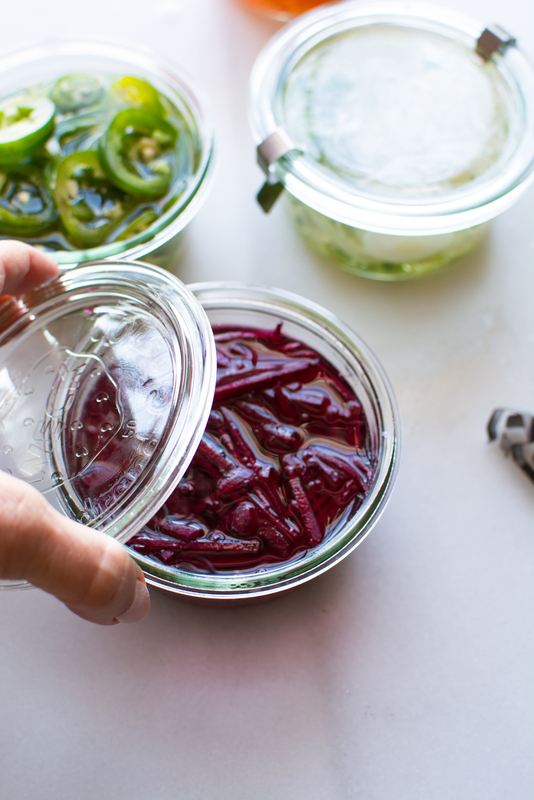 To make the pickled vegetables: Place jalapenos, carrots, beets, and onions in separate jars. 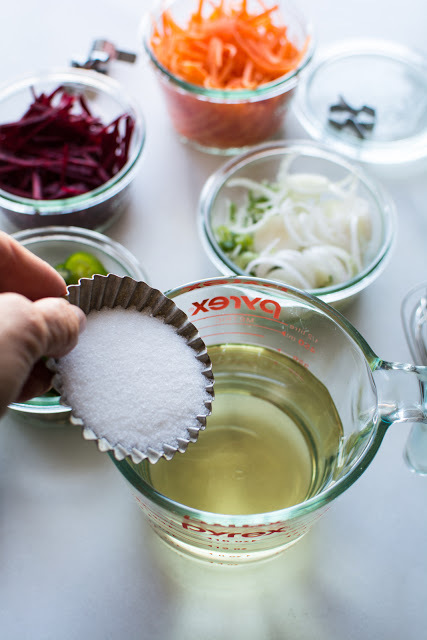 Mix rice vinegar, salt, and sugar together until dissolved. Poor vinegar mixture equally over prepared veggies. Cover and place in refrigerator for at least 1 hour. 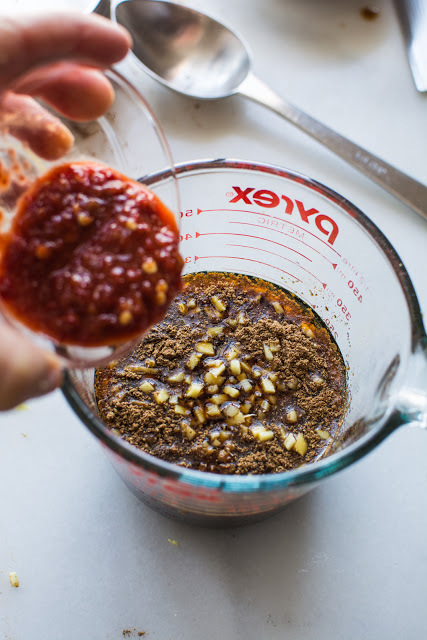 In a small bowl, mix together garlic, ginger, soy sauce, vinegar, Chinese 5 spice, coconut sugar, chili garlic sauce, and sesame oil. Set aside. 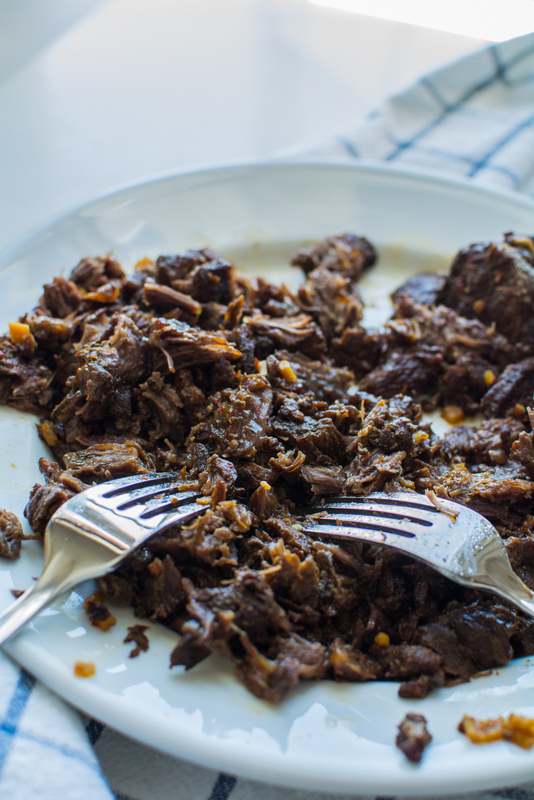 Heat, skillet or pan or pressure cooker, brown beef on all sides in the coconut oil. Do not crowd the pan. 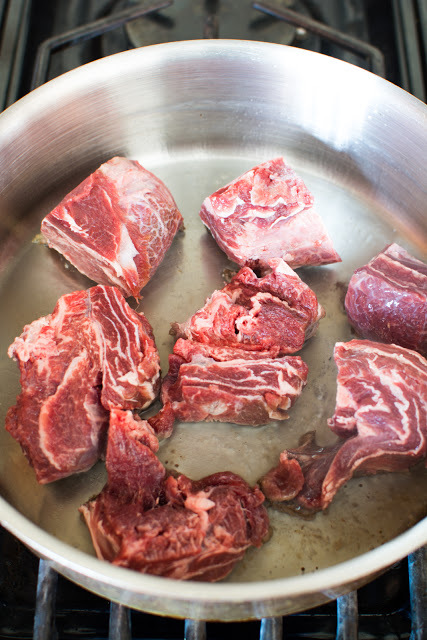 Remove beef and deglaze pan with coconut water, beef broth or water. Return beef to pot or a crockpot. Pour soy mixture over meat. Cover tightly with a lid and cook beef in a 275 degree oven for 4-5 hours or until tender. Remove beef from juices and using two forks shred the beef. Strain off any fat that has accumulated and discard the fat. Return juices to pot. Add beef to pot and keep warm until ready to serve. Crockpot: If using a crockpot, cook on high heat for 4 hours. Follow directions above. Pressure Cooker: Pressure on high for 30 minutes. Follow directions above. 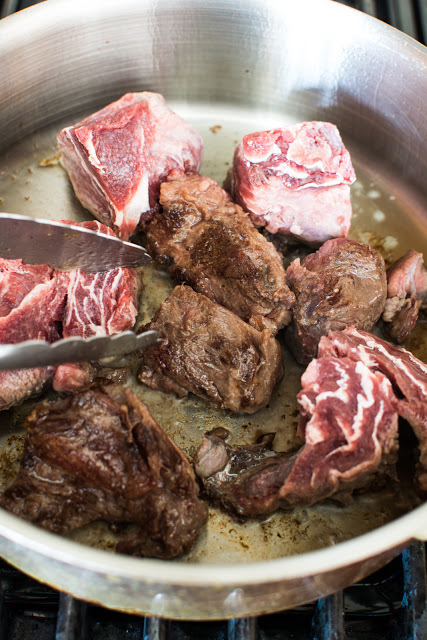 After beef has been shredded and fat has been removed from juices, return to pressure cooker and cook beef in juices on low pressure for another 5 minutes. Beef can be left on low heat until ready to serve for 2-3 hours. 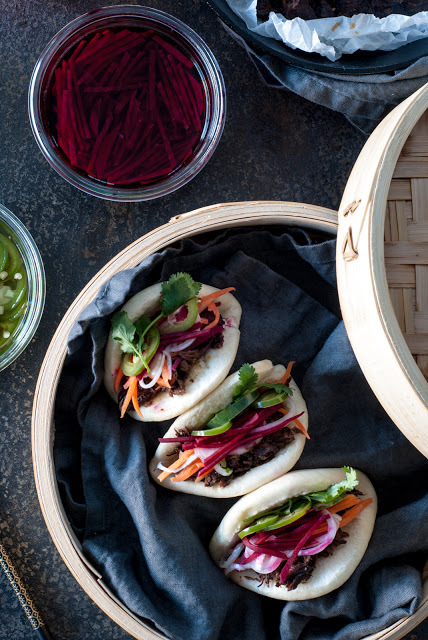 Frozen pre-made steamed buns may be purchased in an Asian market. Follow directions on package for reheating. Note the option for GF or Paleo with the use of Bibb lettuce leaves. 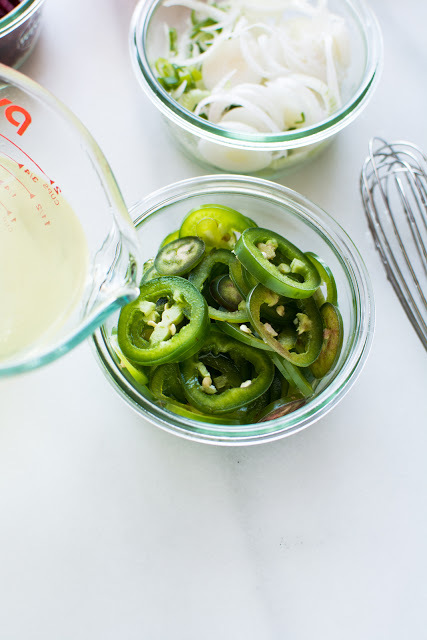 Cucumbers, radishes, or other veggies may be used also. 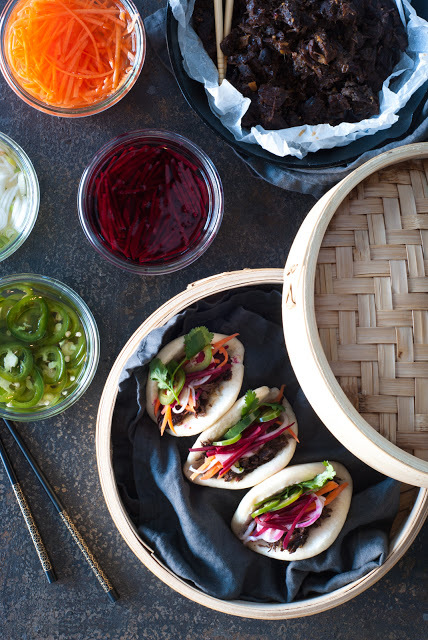 Steamed Buns OR use bibb lettuce leaves to make lettuce wrap optional. Thank you, Tiffany. I agree pickled veg are the best.